Bone broth is similar to stock, except that it’s cooked longer to extract gelatin and minerals from the bones. It’s a whole-food way to get important minerals in your diet, and you can even use your slow cooker. Is bone broth the new coffee? The new green juice? The new kale? In part due to interest in Paleo and ancestral styles of eating, bone broth has been gaining popularity for a while. But it was clear that this traditional food had become a bona fide food trend when it started showing up in fashion magazines, and people started standing in long lines in New York City to buy it in to-go cups, instead of coffee. You might wonder what the difference is between bone broth and “regular” broth or stock. Broth is made from meat with some bones, while stock uses bones with some meat. Bone broth is similar to stock, except that it’s cooked longer in order to extract gelatin and minerals from the bones. Whereas a regular broth or stock might be simmered anywhere from two to 10 hours, bone broths often simmer for 24 hours. Essentially, bone broth is a whole-food way of including important minerals in the diet, leaching calcium and magnesium, as well as protein from collagen and gelatin, from the bones. It’s not a cure-all, but it may have benefits for skin, joint and digestive health. If nothing else, it forms a delicious, nutritious base for homemade soups! Does pineapple juice get rid of hiccups? I’ve cooked bone broth three ways: on the stove top, in the oven and in a slow cooker. It can also be done in a pressure cooker, but I haven’t tried that. The advantage of the oven or the slow cooker is that it’s easier and safer to walk away (even leaving the house) while it’s cooking. Notes: Roasting gives a nice flavor to the broth, so don’t skip it. You may have heard it’s a good idea to spread tomato paste on the bones before roasting — it’s not. The sugars in tomato paste can cause the bones to burn or scorch, harming the flavor of the finished product. • Optional: 1 head garlic, peeled and cloves smashed or very roughly chopped. 1. Preheat oven to 425 F. Place beef bones on a rimmed baking sheet or large roasting pan and roast for 45 minutes, until golden brown. If using the oven method, reduce the heat to 225 F.
2. 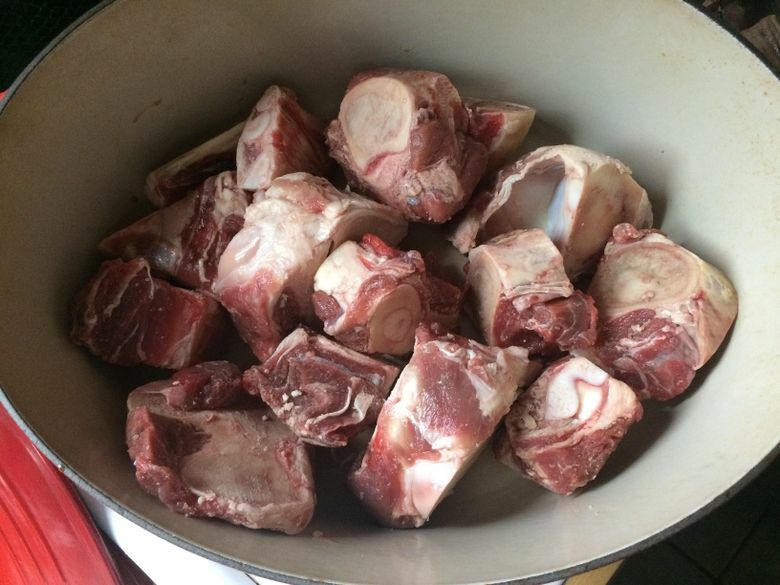 Place the roasted bones, and any accumulated juices, into a large stockpot, Dutch oven or slow cooker (at least 6-quart size). Add the carrots, onion, celery, bay leaves, cider vinegar, peppercorns and garlic (if using). 3. If using the oven or stovetop method, add enough cold water to cover the bones and vegetables. If using the slow-cooker method, leave the water level about an inch below the bones and veggies, since no moisture will be lost to evaporation. 4. Slow-cooker method: Turn the slow cooker to the temperature that will allow it to gently simmer (some cookers run “hotter” than others). Oven or stovetop method: Bring contents to a gentle boil before reducing to a low simmer. Skim off any foam that accumulates on the top. If using the oven, carefully transfer the pot from the stovetop to the oven once it is simmering. 5. Allow to simmer for up to 24 hours, then follow directions for cooling and storing. Note: A lone chicken carcass will net less broth, so use the smaller amount for each of the other ingredients. 1. Place the chicken carcass and/or chicken parts into a large stockpot or slow cooker (at least 6-quart size). Add the carrots, onion, celery, bay leaves, cider vinegar, peppercorns and garlic (if using). Quickly cooling your broth is important for both food safety and top quality. 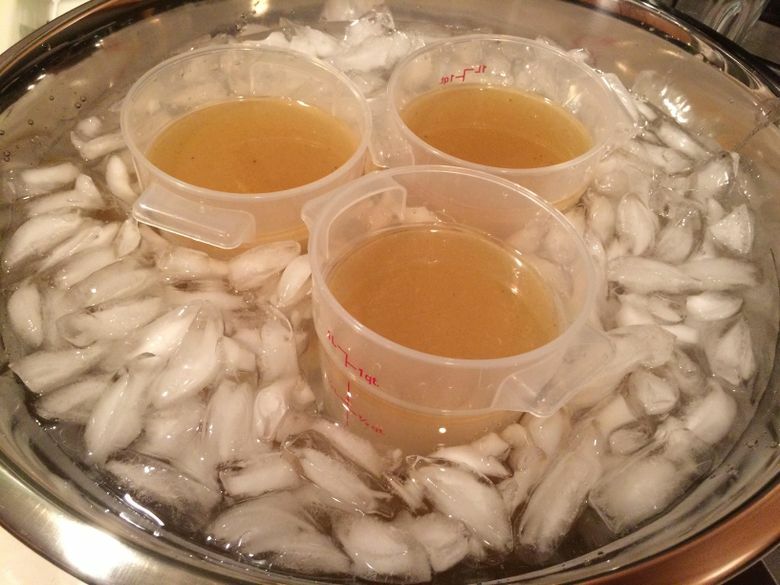 After removing bones with tongs and straining the broth, I cool it in small containers in an ice bath before refrigerating it. When it’s cold, I remove the layer of hardened fat that has accumulated on the surface. 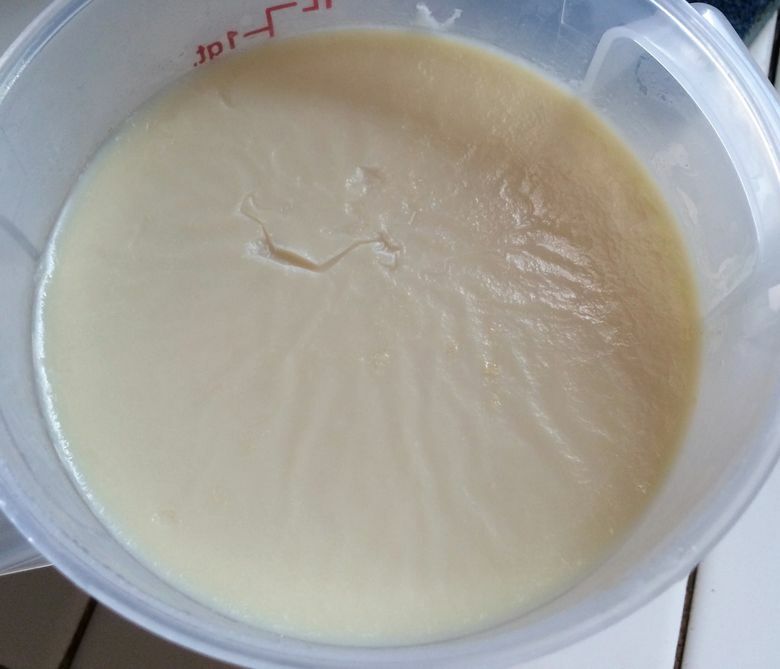 The cold stock usually resembles tan jelly, which is simply evidence of the lovely collagen that has been extracted from the bones. 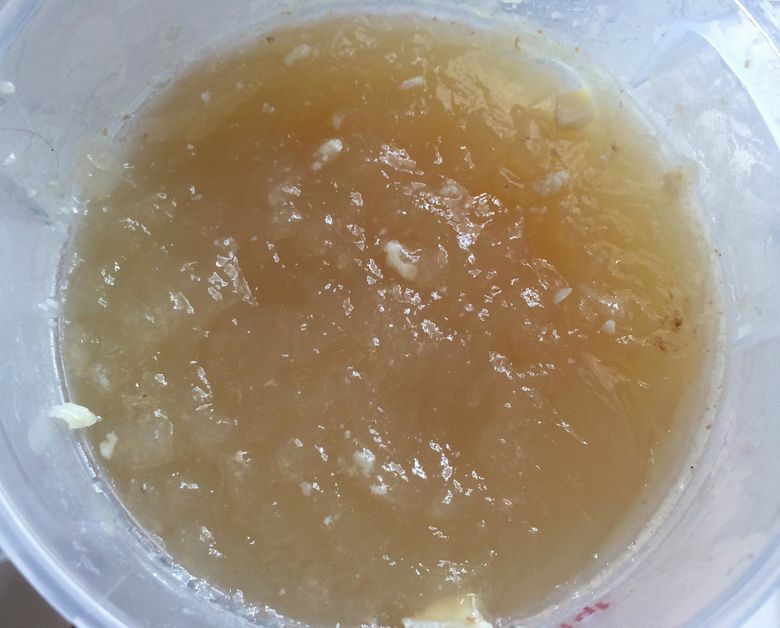 However, if your broth doesn’t gel (there are various reasons why this happens), that doesn’t mean it isn’t nutritious!